Tesla offers two sizes for the Model S, a 19″ and a 21″ wheel. For more details on the stock wheel options, please refer to an older post about Tesla’s wheel offerings. A common opinion seems to be that 21″ wheels are too large for comfortable use, and are a lot more susceptible to pothole damage, so a slightly smaller wheel with a diameter of 20″ might be a feasible alternative. With this goal in mind, after spending about three months researching, planning and getting all the parts, I eventually completed my thoroughly planned wheel and tire setup for my 2014 Tesla Model S P85. The next challenge was actually installing the wheels. I acquired a set of third-party tire pressure monitoring sensors for the new wheels. I needed to go with the older generation sensors as I am below VIN 50600. Newer Tesla Model S and X require a different type of sensor and are not compatible with each other. Be sure to purchase the correct ones, if you do. With those in place, I had to come up with a solution for centering the wheels, as unfortunately the center bore of the wheel was not 64.1mm as specified by Tesla, but 74.1mm instead. It is quite common for third-party wheels to have larger center bores to ensure a broader vehicle compatibility. To make them fit, they are supplied with correctly sized plastic rings that step down the center bore from the wheel to your specific vehicle. The Tesla, however, has a very shallow centering element on the end of the axle. This meant that a plastic centering ring will be pretty much useless as there wouldn’t be any reasonable contact area to take any force at all. I, therefore, decided to design and manufacture a set of custom made aluminum rings that are flat on the vehicle side to ensure maximum contact to the Tesla axle, and have a relatively long centering cylinder going into the wheel. The tolerances worked out great. I decided to fix the rings to the axle of the car by sticking to 64.1mm as close as possible without adding anything to overcome tolerances. This allowed me to install them easily by heating them up with a hot air gun, which expands the rings and then let’s you install them on the vehicle’s axle. After they cooled down, the rings were seated firmly and would not fall off by themselves. Removing them in the future will be easy, but might require the application of a little bit of heat. Another issue that came up with the new set of wheels were the lug nuts. 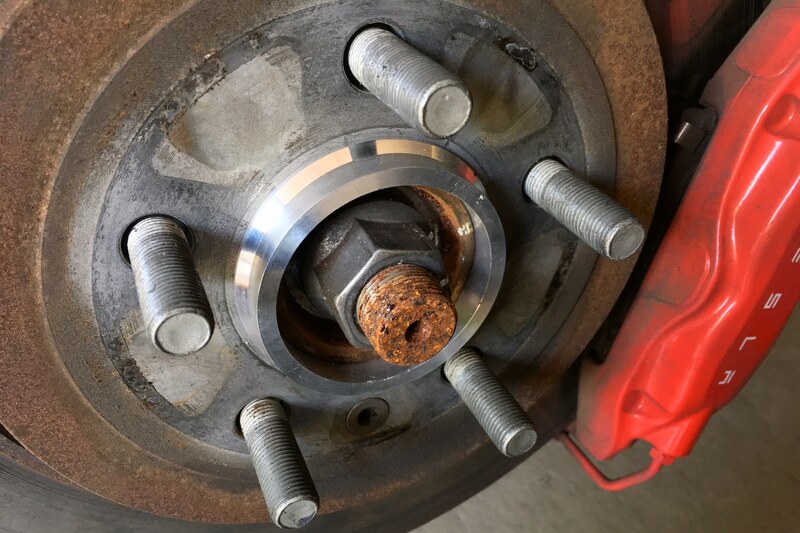 I needed to find a set of lug nuts that would be slim enough to fit in the new wheels and long enough to enclose all of the thread from the bolts. The original Tesla lug nuts would not fit, because they were too wide. I ordered a 41mm long and 19mm slim set of M14x1.5mm lug nuts. They were an ideal fit, but are not the finest ones available. Future plans will be to acquire a set of 65315BK from McGard, or the chrome equivalent. They are an excellent fit, prevent theft and have a separated seat for increased mechanical safety. Last but not least, I wanted to have a set of center caps that showcased the Tesla logo, just like the factory wheels. So I ordered a set of custom made stickers that I installed into the caps that came with the wheels. I have purchased the TEC Speedwheels GT6 Ultralight wheel in the color black. It features a 10 spoke lightweight design, has a polished outer ring and has an increased load rating of up to 900kg. It is available in the dimensions specified above and was available for a rather low price. The full set of wheels was just under 1000 Euros. They came with no accessories other than the center caps with the TEC Speedwheels logo. Both the front and the rear wheel share a PCD of 5/120 with a center bore of 74.1mm. Finding a suitable tire that also matches the staggered setup desired is another challenge. 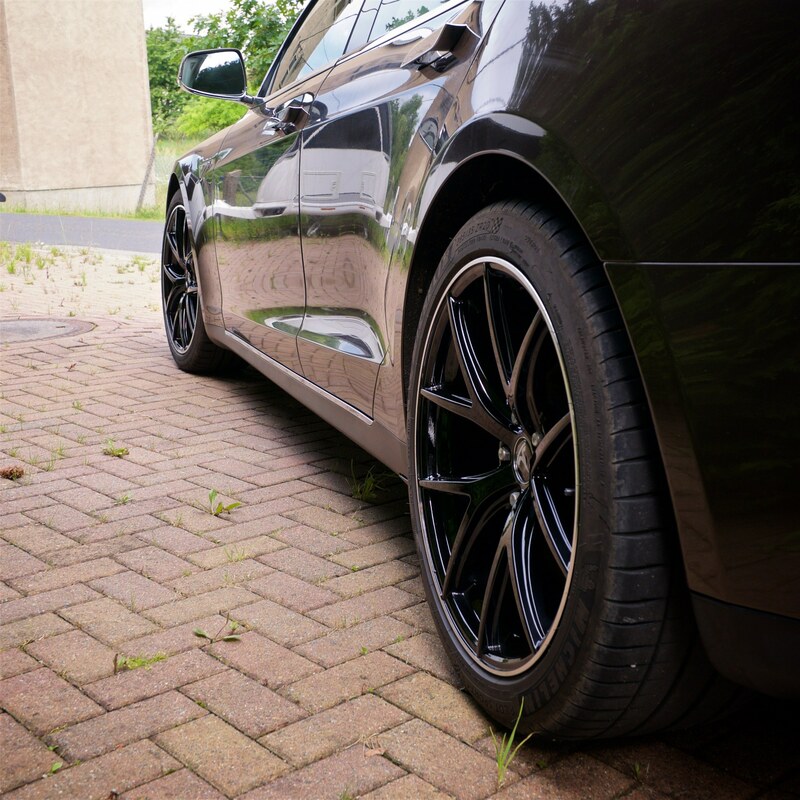 For summer tires, I decided to go with the Michelin Pilot Sport 4S tire as it is a very new ultra-high performance tire they just released end of 2016. It is the successor to the all-outperforming Michelin Pilot Super Sport tire that has been on the market for over 6 years now. It has been designed together with the Formula E tire and differs only marginally. Could there be a better choice for an all-electric high-performance sedan? Luckily, both dimensions were available without manufacturer ratings, such as N0, RO1, *, MO, MGT, etc. These ratings have an effect on the tires and I would not recommend mixing different ratings per vehicle, unless specifically designed for that. For example, the Lotus Evora is set up to be driven with a set of Pirelli P-Zero MO (Mercedes-Benz) tires on the front and MO1 (AMG) on the rear. In case of the Michelin Pilot Sport 4S, both the front and rear tires carry the XL (extra load) rating, being an ideal match for the heavy Tesla Model S. The tires features a new hybrid compound technology by using a softer compound on the inner shoulder during easy driving conditions and for wet braking performance, and a harder compound for dry cornering in heavy load conditions on the outer shoulder of the tire. Michelin reports a longevity of the tires of up to 52032 km, comparing to 29658km on the Continental SportContact 6 tire, just as an example. I have been using this set of wheels and tires for over 25,000km now, including my 4250km long road trip through Europe. So far I have had a total average power consumption of 188 Wh/km (303 Wh/mi) which is only slightly more than the stock 19″ setup with the Goodyear Eagle RS-A2 all-seasons tire that I’ve been using before, which averages to about 184 Wh/km (296 Wh/mi). The wheels are excellent quality, no imbalance could be detected and they have some great looks. The feedback I have received so far is 100% positive. They match the old front facia quite well, with the black/chrome-outline design cue on both the vehicle’s front and the wheels. The tires are excellent as well. Awesome grip, very low wear on the thread and amazing wet handling capabilities, which was something the old RS-A2 tires were absolutely incapable of handling. Overall, the power consumption is much better than I anticipated. If you are in a stop-and-go type of traffic, ranging up to 60-80 kph, you are actually looking at a strong energy saving over the stock 19″ wheels, due to the lower total weight of both the rear and front tire and wheel combinations. I have seen as low as 150 Wh/km (241 Wh/mi) during those scenarios. 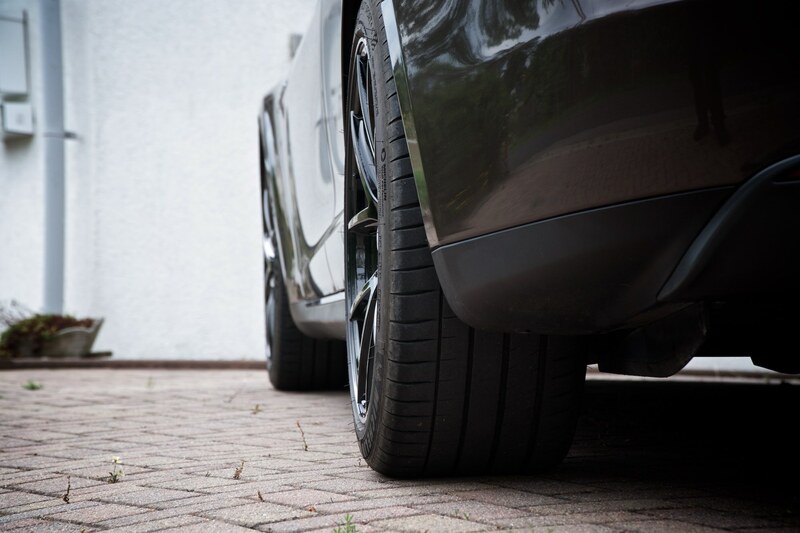 Long distance, high speed travels, however, will cost you a bit more electricity due to the higher contact area of the rear tires and the amazing grip of the new tires. If you are interested in a set of these wheels, feel free to contact me and I will be able to assist you in acquiring these for your Tesla. 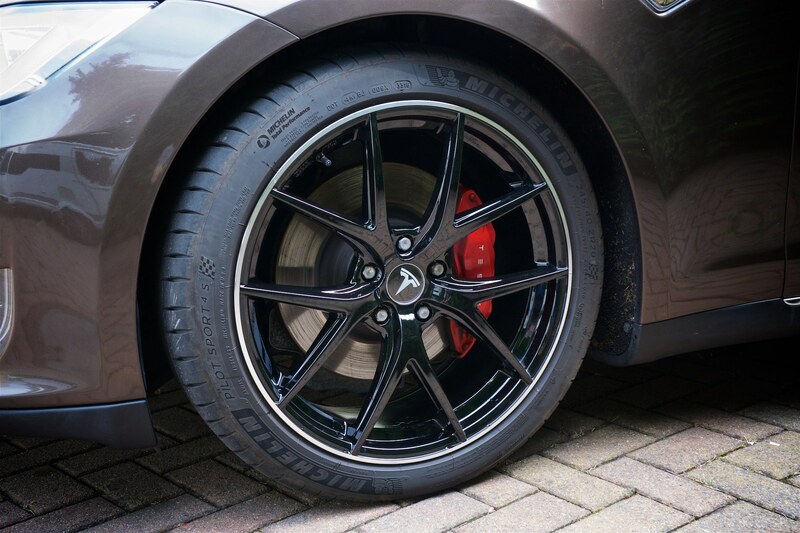 The wheels, tires and TPMS can be purchased independently, of course. 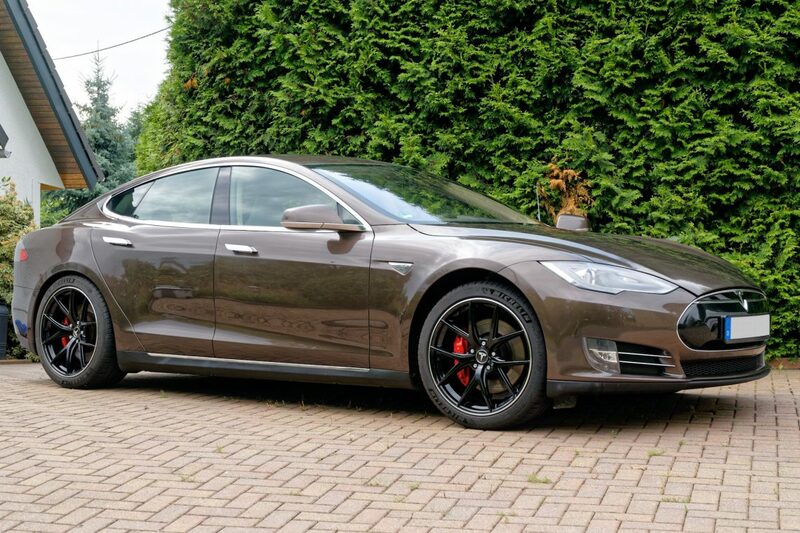 I can provide the accessories kit, if desired, which will include the Tesla center caps, aluminium centering rings, lug nuts and a copy of the documents to aid in the process of getting the wheels approved for your Tesla. © 2019 The Nerdy Talk. Theme by Anders Norén.